Focusing on narratives of kinship as they are defined in contemporary film, literature, and news media, Frances Bartkowski discusses the impact of "stories of origin" on our regard for nonhuman species. She locates the role of "totems and taboos" in forming and re-forming kinship categories-groupings that enable us to tie the personal to the social-and explores the bestiary, among the oldest of literary forms. The bestiary is the realm in which we allegorize the place of humans and other species, a menagerie encompassing animals we know as well as human-animal chimeras and other beings that challenge the "natural" order of the world. Yet advances in reproductive technologies, the mapping of genomes, and the study of primates continually destabilize these categories and recast the dynamic between the natural and the cultural. 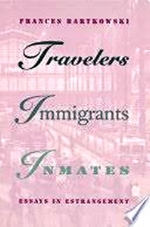 Travelers, Immigrants, Inmates was first published in 1995. Minnesota Archive Editions uses digital technology to make long-unavailable books once again accessible, and are published unaltered from the original University of Minnesota Press editions. Identities are always mistaken; yet they are as necessary as air to sustain life in and among communities. Frances Bartkowski uses travel writings, U.S. immigrant autobiographies, and concentration camp memoirs to illustrate how tales of dislocation present readers with a picture of the complex issues surrounding mistaken identities. In turn, we learn much about the intimate relation between language and power. Feminist Utopias is a comparative study of the utopian fiction of nine women writers in the United States, France, and Canada. Except for Charlotte Perkins Gilman's Herland (1915), the prototype for feminist literary utopias, all of the works were published between 1969 and 1986. Bartkowski discusses Monique Wittig's Les Guérillères, Joanna Russ's The Female Man, Marge Piercy's Woman on the Edge of Time, Suzy McKee Charnas's Motherlines, Christiane Rochefort's Archaos, ou le jardin étincelant, E. M. Broner's A Weave of Women, Louky Bersianik's The Eugelionne, and two dystopian novels, Charnas's Walk to the End of the World and Margaret Atwood's The Handmaid’s Tale. Feminist Theory: A Reader co-edited with Wendy Kolmar, Drew University, represents the history, intellectual breadth, and diversity of feminist theory. The selections are organized into six historical periods from the 18th century to the late 2000s and include key feminist manifestos to help readers see the link between feminist theory and application.